I know that there are large factions of people in America who think a sweet potato isn’t worth eating if it doesn’t have marshmallows on top. I’ve tried to see that point of view. I like marshmallows. I have nothing against sweet things. Last year I even bought those canned sweet potatoes in syrup and baked them up, topped with marshmallows. My reaction was decidedly meh. No texture, no flavor – its like someone is trying to get kids to eat their vegetables. For me, sweet potatoes sing when they are paired with something savory. Not maple syrup, butter. Not brown sugar, smoked paprika. Instead of the ubiquitous marshmallows, a salty sharp Gorgonzola. My signature sweet potato dish is the gratin with smoked paprika and cayenne I posted 2 years ago (an aside: where does time go? 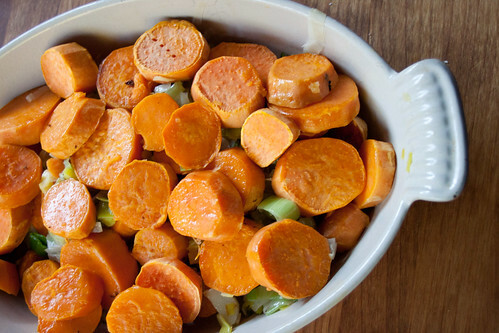 ), but this savory sweet potato casserole might just give it a run for its money. The downside of this dish is that it takes a truly absurd number of pans. One to sauté the leeks. One to roast the sweet potatoes. One to toast the walnuts (I reused the sweet potato pan). One to melt the Gorgonzola cream. And finally, a gratin dish to bring it all together. The upside is that almost all of this can be done in advance, so by the time you actually need to get Thanksgiving dinner on the table, the pans have long since been washed and put away, or repurposed for Brussels sprouts, mashed potatoes, cranberry sauce. The other upside is that this sweet potato casserole is truly delicious. I think leeks are an underutilized vegetable – they make just about anything more elegant. Their savory mellowness, combined with the sharp tang of Gorgonzola really contrast nicely with the sweetness of the roasted potatoes. Since this is a holiday dish, I’m not shy about using butter and cream to marry the elements together, and the earthy crunch of toasted walnuts finishes the dish. It’s worth washing a million pans, and of you know me, you know I am not one to say that lightly. This Thanksgiving, save the marshmallows for dessert (or the next weekend’s hot cocoa) and try letting your sweet potatoes dress like a grownup – you won’t be disappointed. Thinly slice the leeks. In a deepish pan, melt the butter, add the leeks and the thyme and sauté over medium heat until the leeks are translucent and tender. Salt to taste, being aware that the cheese is quite salty. In a small saucepan, crumble the Gorgonzola into the cream and heat until the cheese is melted. In a gratin dish, arrange the leeks. 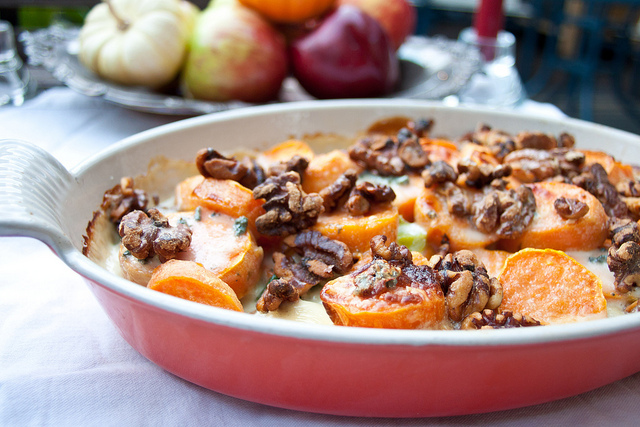 Top with the sweet potatoes, and pour the Gorgonzola cream over the entire thing. (you can make it ahead until this point). Top with walnuts. Bake at 350 for 20-30 minutes until heated through and the cheese is bubbling.